Blackjack…. Pontoon? Aren’t they the same? Blackjack and pontoon are almost identical games but there are a few differences you’ll need to know. In our guides the differences are written in bold so you know exactly where you stand. Your first decision to make is how many hands you wish to play against the dealer (you can either play one hand, three hands or five hands). Playing multiple hands or ‘boxes’ is a lot of fun – it gives you more chances of beating the dealer and is a tactic commonly used by high rollers when they play. In blackjack, both the player and the dealer receive two cards in the opening deal. Both player cards are dealt face up but only the dealer’s first card will be showing, unlike pontoon where none of the dealer’s cards are visible until showdown. The aim of the game is to make a hand as close to 21 as possible without going over (going over 21 is ‘busting’ and, as the name would suggest, this isn’t a good thing). Each card is worth its own rank (so a 7 is worth 7), picture cards are worth 10 while an ace can be either 1 or 11. Following the opening deal, you can choose to ‘hit’ or ‘stand’. If you hit, you’ll get dealt another card to try and get closer to 21 (remember though, going over 21 means you bust and lose regardless of the dealer’s hand). You can keep hitting as many times as you want, and once you’re happy with your hand you can stand. Once you stand, it’s the dealer’s turn to try to beat you by getting closer to 21. At the casino the dealer must keep hitting until his hand is worth 16 or higher and he must stand when his hand is 17 or more. If the dealer busts, then you win the bet and are paid an amount equal to your stake. If the player and the dealer both have a hand worth the same value, it is a ‘push’ and the stake money is returned. 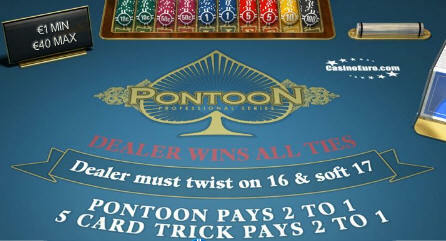 This is different to Pontoon where the dealer wins when there’s a push. Getting dealt an ace and a 10 value card is ‘Blackjack’, and pays out 3-2 (so you’d win $15 on a $10 bet for blackjack). Blackjack always wins unless it comes up against another Blackjack (in which case it’s a push). If you’re dealt two cards of the same value (for the purpose of splitting, 10s, jacks, queens and kings are all worth the same) you may elect to ‘split’ and make two hands from your two cards. For example, if you were dealt queen-jack and you split, each hand would receive another card so that you now have two hands. You can keep taking cards until you are happy with your hand and then stand. The only exception to this rule is when you split aces – do this and you’ll only receive one more card to make your hand. In pontoon there is no limit on hitting when you split aces. Splitting cards requires you to make another bet so that each hand has the same amount riding on it. For example, if you bet $10 and split, you must bet another $10 making a total bet of $20. After the opening deal you can choose to ‘double’ in the casino (you cannot double after you hit – this is different to pontoon where you can double at any time). Doubling is pretty much as you’d expect – it doubles the size of your bet and can help you stake more when you think you have the best of it. Once you have decided to double, you will receive one more card – so don’t double because you have 20! If the dealer’s up card is an ace, you can take insurance – this insures your bet against the dealer having Blackjack. When you opt for insurance, you make a further bet of half your original stake (so if you were playing for $10 a hand, insurance would cost a further $5). This bet pays out 2-1 should the dealer have Blackjack so you get your entire stake back. If the dealer doesn’t have Blackjack, you lose your insurance bet and the hand plays out as normal. Insurance is not an option in pontoon. This entry was posted in Casino and tagged blackjack. Bookmark the permalink.